If you've been looking at 50" big-screen TVs, Samsung's compact HL-S5686W might allow you to enjoy a noticeably bigger 56" screen in about the same space. 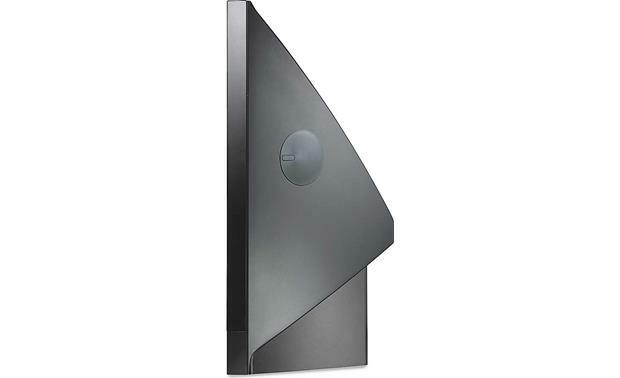 Samsung's "thin-bezel" cabinet increases visual impact with its nothing-but-screen design. 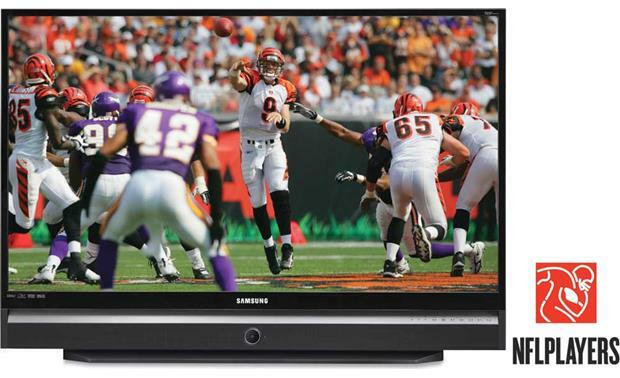 Samsung builds the widest selection of DLP-based TVs, and theirs continue to be the best-selling DLPs on the market. The HL-S5686W expands on DLP's reputation for crisp images, outstanding contrast and black level, and effortlessly smooth motion handling. DLP is actually the "fastest" display technology  the chip's million tiny mirrors switch on and off over 15,000 times per second. The BrilliantColor video processing system improves color intensity and accuracy while also increasing overall brightness. The HL-S5686W's generous array of audio/video inputs includes two HDMI digital connections so you can take advantage of the most advanced video components, like high-definition disc players. This versatile performer includes a game mode which pumps up the sonic and visual excitement of your favorite games. And a standard PC input lets you use this TV as a jumbo-sized computer monitor  with no worries about screen burn-in. DLP Projection System: DLP (Digital Light Processing) technology by Texas Instruments is the only display solution that enables projection systems to create a purely digital connection between a digital video or graphic source and the screen in front of you. While all other technologies are analog and compromise some image quality in translation, DLP projection unleashes the full potential of high-quality video content. Cinema Smooth 720p Light Engine: Samsung's Cinema Smooth 720p light engine releases the maximum power of the new generation of DMD microdisplays for the most film-like picture. It creates an image with no visible pixel structure and accurate shading and better low-light detail. Faster Color Wheel: Samsung's 2.2" color wheel spins at 14,400 rpm for smooth fast motion video, and has five color segments for more accurate colors. It achieves film-like transitions without pixel breakup found in slower color wheel designs and slower switching LCD microdisplays. Air Bearing technology also makes it very quiet. 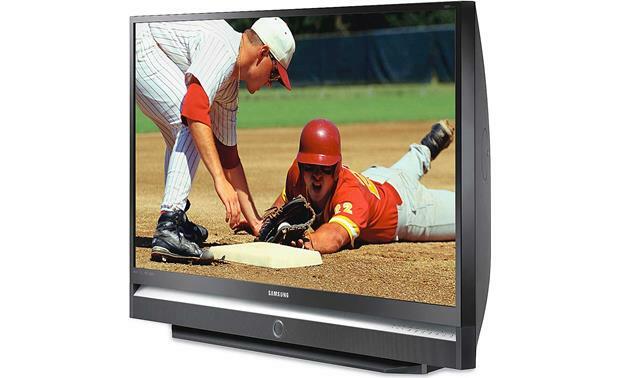 Native Resolution: The television has a display resolution of 1280 x 720. The HDMI and component video inputs will accept 1080i, 720p, 480p, and 480i signals, and will display them as 1280 x 720. All other input signals will also be displayed as 1280 x 720. HDTV (ATSC) Tuner: The TV has a built-in over-the-air HDTV (ATSC) tuner, so you don't have to purchase a separate digital set-top box to receive and decode over-the-air HDTV/SDTV signals. The TV also has an NTSC analog tuner. Cinema Mode: Samsung's Cinema Mode lets you see colors the way the director intended, by matching them more closely to production standards. 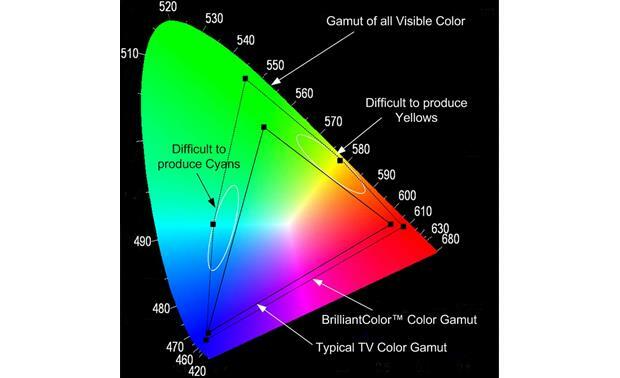 This creates more accurate colors and natural skin tones when viewing movies on your TV. Digital Natural Image Engine (DNIe): Samsung's DNIe makes input signals sharper, clearer, and more lifelike. It's advanced image processors and six-times density enhancer help to create true-to-life colors and high contrast, while virtually eliminating digital artifacts. MCC (My Color Control) Mode: The MCC Mode lets you select predefined settings that affect the skin, sky, and grass tones in a picture without affecting other colors on the screen. You can choose one of the following predefined settings: Standard, Blue, Green, Pink, or Custom. The Custom setting allows you to individually set and store color saturation values between 0 and 50 for Blue, Green, and Pink. If desired, you can instantly reset the colors to the factory default. View: You can view individual photos by selecting them from the thumbnail display. Rotate: This feature allows you to rotate the selected image by 90°, 180°, or 270°. Zoom: You can enlarge a picture 2x or 4x. Once the image is enlarged, you can move it around onscreen. Slide Show: You can play files on the USB device in a slide show. You can adjust the slide show speed to Slow, Normal, or Fast. You can also choose an MP3 file on the USB device to play as background music during the slide show. The repeat function allows you to play the slide show again and again. MP3 List: This menu shows MP3 files saved on the USB device and allows you to play them back. Color Weakness Enhancement: The Color Weakness Enhancement feature adjusts the Red, Blue, or Green color to enhance the picture according to the user's particular color weakness. Digital Signal Strength Meter: The digital signal strength meter can be used to help you find the antenna position that delivers the highest HDTV digital signal strength. Low Noise Amplifier (LNA): When the TV's antenna setting is on "Air," instead of "Cable," sometimes reception can be improved by boosting the incoming signal using the LNA function. A separate LNA setting may be put into the TV's memory for each channel. Auto Volume: Auto volume automatically adjusts the volume of the desired channel by lowering the sound output when the modulation signal is high or by raising the sound output when the modulation signal is low. Sleep Timer: The sleep timer switches the television off after a specified amount of time. The sleep timer can be set from 30 to 180 minutes. On/Off Timer: The On and Off timers allow you to program the television to turn itself on and off by selecting a specific time. You can also choose the channel and volume for the On Timer. If no controls are operated after the On Timer activates the TV, it automatically turns off after three hours. 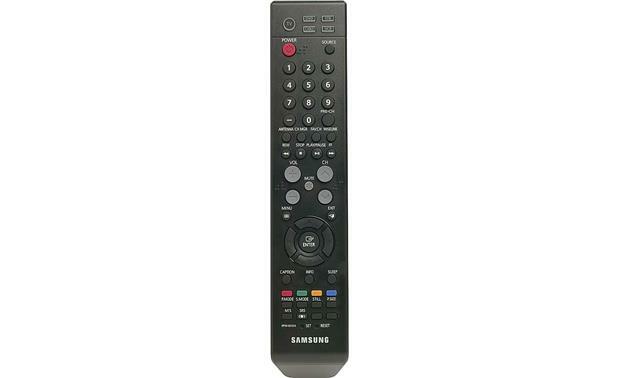 Multi-brand Remote: The supplied remote is pre-programmed to operate this unit and a number of functions on other brands of components, including VCRs, cable boxes, DVD players, and set-top boxes. Side Panel Inputs: The TV features a set of audio/video jacks (composite video and stereo RCA audio) on the right side panel. These jacks allow you to easily and quickly connect a camcorder or video game console. A USB Type A port allows you to connect a USB mass storage device to view JPEG files and play MP3 audio files. HDMI: This input consists of two HDMI terminals and a set of RCA audio jacks. 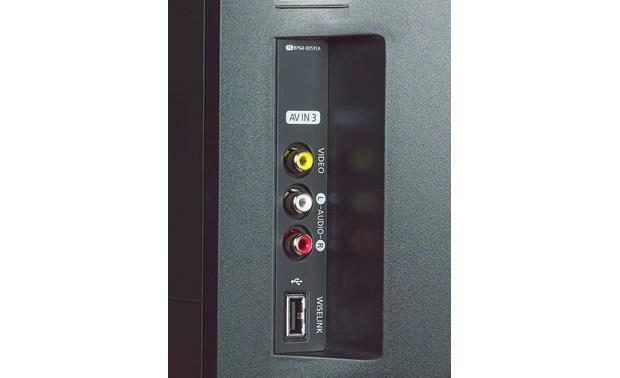 The HDMI terminals can accommodate a copy-protected digital connection (HDCP) to other devices (such as digital set-top boxes) that have compatible interfaces. One of the HDMI terminals, along with the RCA audio jacks, can be used for a DVI-equipped component. A separate analog audio connection and a DVI-to-HDMI adapter will be needed. The HDMI jacks accept 1080i, 720p, 480p and 480i signals. PC: This input consists of a stereo minijack and an analog RGB (D-Sub 15-pin) jack. This jack allows you to connect a personal computer with a D-Sub 15-pin output. When using the D-Sub 15 jack, you must use the PC Audio input for your audio connection. Component Video Inputs: The 2 sets of component video inputs will accept 1080i, 720p, 480p and 480i signals. Antenna Inputs: Antenna 1 is a cable input and antenna 2 is an over the air antenna input. 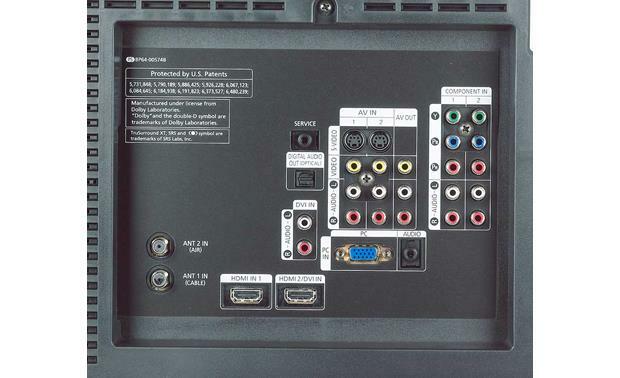 Service Jack: The rear panel of the TV has a minijack input for servicing.